Every user who would like to have access to PowerWebTraffic will need the PowerWebTraffic User security role assigned to them. 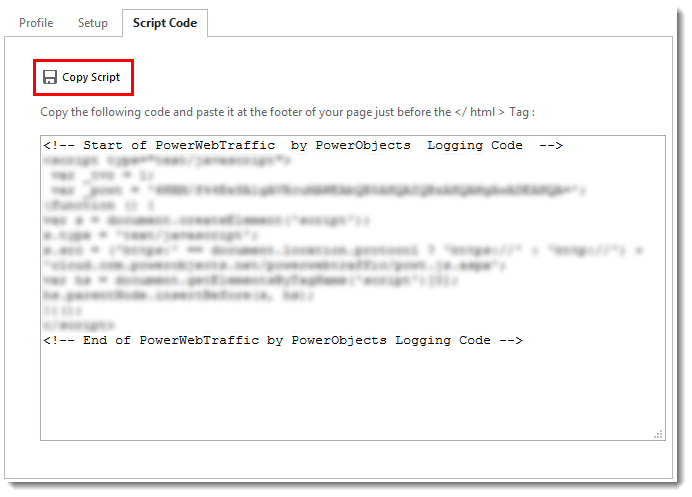 System Administrators will automatically see PowerWebTraffic in their left navigation, even without having the security role assigned. The PowerWebTraffic Service Account security role is meant to be assigned to the user whose username and password is entered in the PowerWebTraffic solution. The PowerWebTraffic User security role gives users the privileges to access the PowerWebTraffic entities in the CRM system. 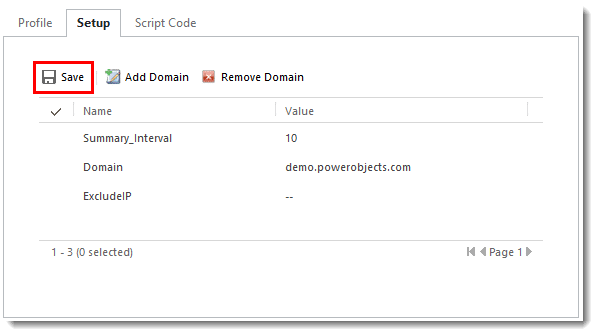 Once you have imported and registered the PowerWebTraffic solution for your Microsoft Dynamics CRM system it will need to be configured. To configure PowerWebTraffic navigate to Settings > Solutions and double click on PowerWebTraffic. Click on the Setup tab to configure your settings. 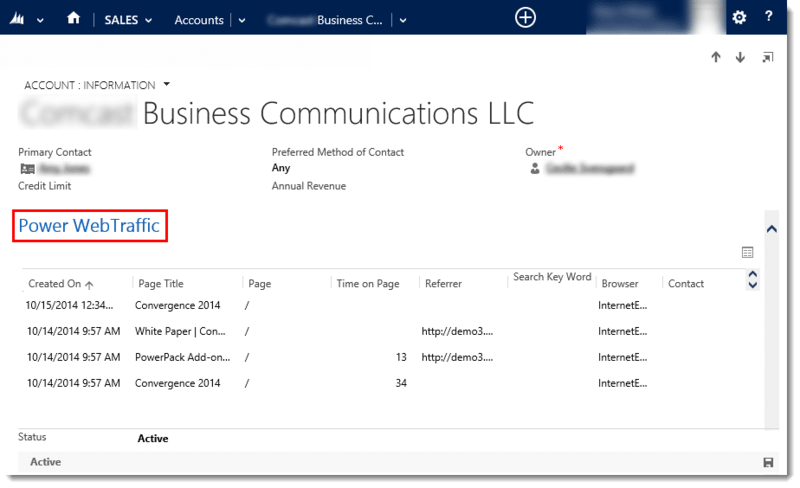 In the Value column next to Domain, enter the name of the Domain you would like to track. Do not include http:// or https:// in front of your domain value. If you’d like to track more than one domain, click on Add Domain and enter the other domain(s) you wish to track, when complete click Save. Note: Do not include any extra /’s before or after your domain name. It is unnecessary to add each sub-domain, you only need to add the main domain name. If you would like to exclude a number of IP addresses, or a range of IP addresses, you can put them in the value column, next to ExcludeIP. Separate your IP’s by semi-colons (no spaces), and if you are putting in a range of IP’s make sure to input the range with a dash in between (again, no spaces). The web traffic from these IP addresses will not be included in your PowerWebTraffic. The summary interval defaults to a value of 10. This means that the time frame between summary calculations is 10 minutes. If you would like this to be more or less frequent, please change the number in the Value column, and click Save. Remember to hit Save after you have made any changes to this screen. This is the code that you will need to add to your website for the solution to work properly. Click on the Script Code tab and select Copy Script. Then navigate to the footer of the main page for each of the domains you entered in the setup tab and paste the script right before the </body></html> tags. Users can change this view to see the information that is pertinent to them, such as all web traffic or a specific period of time or visiting companies. Additionally PowerWebTraffic offers graphs associated to each view, so that users can drill further down into the information. Note: If a visitor bounced after they visited a specific page, there will not be anything displayed in the “time on page” column. The Web Traffic Summary gives users an organized summary of web traffic on their domain. 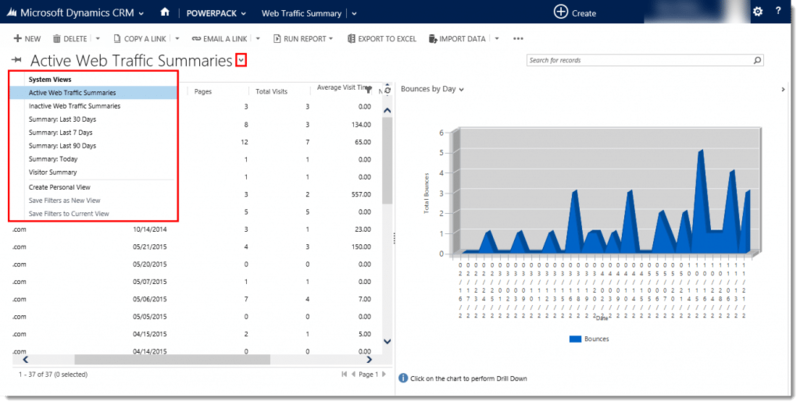 Users can change the view to look at various web traffic summaries, and drill down into the associated charts. In order for PowerWebTraffic to connect a website visitor’s web traffic with their CRM contact or lead record, an email with a link to the website that’s being tracked needs to be sent to that contact or lead from CRM and the contact or lead needs to click on that link. There are many ways to get a CRM contact/lead to click on a link, without directly telling them that you want to track their web traffic on your website. Create a workflow that automatically sends someone an email when they are created as a lead or contact in your CRM, thanking them for their interest in your company, with a link to your website. Create a bulk email (by using the PowerMailChimp add-on) and send that to your contacts and leads, appending an extra little token to the ends of each URL in the email (read the blog). Send an individual email from CRM, with a link in the body of the email to the website being tracked by PowerWebTraffic. After the email message is sent out of CRM, the URLs within the email will automatically be updated with PowerWebTraffic tracking tokens. If you hover over the link in the email, you can see the appended token there. Note: The email message must be set regarding a lead or contact, in order for the tracking tokens to be appended automatically. 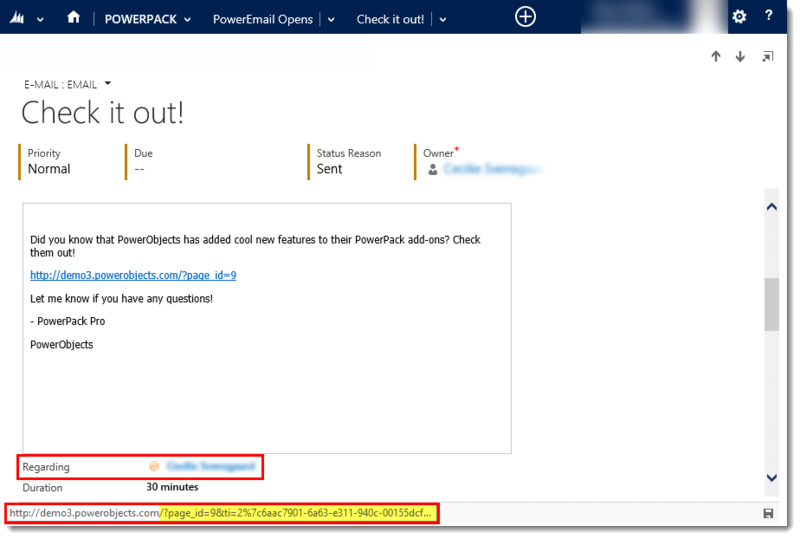 Note: PowerWebTraffic will not append the necessary tokens to the links of an email sent from Outlook. 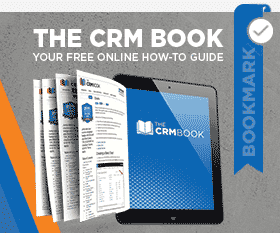 The email message must be created inside of CRM. When you open a contact/lead record you will notice a new tab entitled “PowerWebTraffic.” If this contact or lead has web traffic connected to them, you will see data within that tab on the record. The chart will show you how many pages the person visited on your website, day over day, for the last 6 months. The subgrid displayed below the chart will show you which pages they visited on your website, over the last 6 months. Note: This tab will be located on the “Information” form of the record. If PowerWebTraffic finds a match between the company name of any web traffic, and an account name in your CRM, it will automatically pull that web traffic into that account record. That way, you may not know who from a specific company is on your website, but you can at least keep track of the fact that someone from that company is interested in your website. In order to best use this feature, it is a good idea to manually check for company names in the web traffic section of CRM, and modify the account names in CRM accordingly. Note: The PowerWebTraffic tab will automatically be added on the “Information” form. 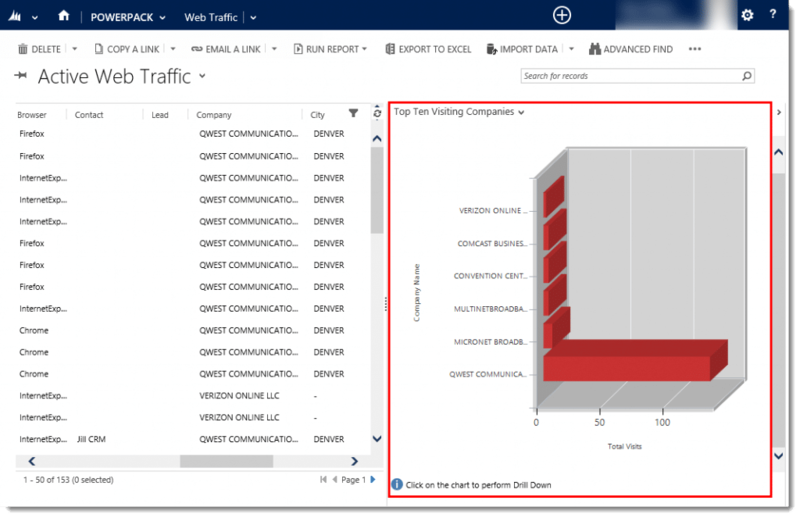 There are 6 dashboards that are automatically added to CRM when PowerWebTraffic is imported. Three have to do with general web traffic summaries, and three have to do with known website visitors. You will notice that there are three dashboards that have to do with web traffic summaries, titled “PowerWebTraffic”. Each dashboard specifies a time period – today, last 7 days or last 30 days. Each of these dashboards display graphs of the top ten visiting companies, the top ten pages, the visits by browser, the visits by country, the pages by day, and the clicks by day. The web traffic visitors dashboards will tell you more about your website visitors, titled “PowerWebTraffic Visitors”. These three dashboards are also differentiated by a period of time – today, last 7 days or last 30 days. Each dashboard will display charts of the top ten known leads, the top ten known contacts, the top ten referrers, the top ten new visitor producing referrers, the bounces by day, and the visits breakdown by day. 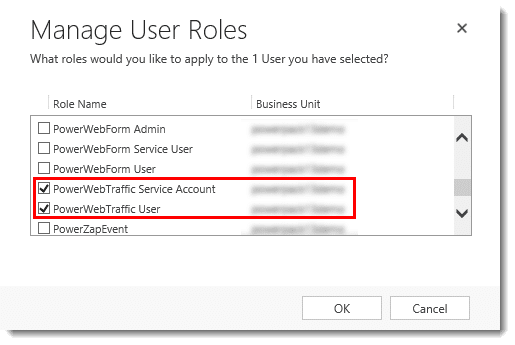 To uninstall, first delete any PowerWebTraffic web traffic records that have been created – you may need to set up a bulk delete job to do this. 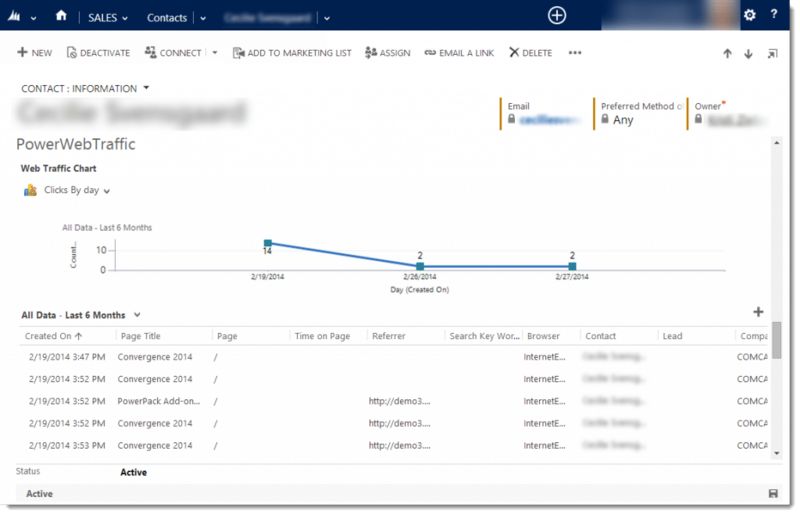 Then uninstall as usual, by deleting the solution from the solutions list in CRM. Deleting this solution will remove all activities and data collected from PowerWebTraffic from your system, if you wish to keep this information simply “Unsubscribe” and leave the solution in your CRM. Thank you for your interest in PowerWebTraffic, should you choose to subscribe you will be charged $1/enabled CRM user/month. If you have any questions or run into any issues with PowerWebTraffic, our friendly support team is here to help!